Toss the 1/3-inch-thick squash slices with the 2 tablespoons of kosher salt and let stand for 45 minutes. In a large bowl, combine the cider vinegar with the sugar and stir to dissolve the sugar. Rinse and dry the salted squash and add it to the bowl; toss to coat with the vinegar. In a blender, puree the 1/2 cup of olive oil with the garlic and transfer to a small saucepan. Bring to a simmer, then pour the garlic oil over the squash. Add the tarragon sprigs and mint leaves and press to compact. Cover and refrigerate overnight. Light a grill. Lift the squash out of the marinade; scrape any excess marinade back into the bowl and reserve. Grill the marinated squash strips over high heat until nicely charred, about 1 minute per side. Cut the squash into 1-inch pieces. Bring a large pot of salted water to a boil. In a large, deep skillet, heat 1/4 cup of the reserved marinade and add the saffron. 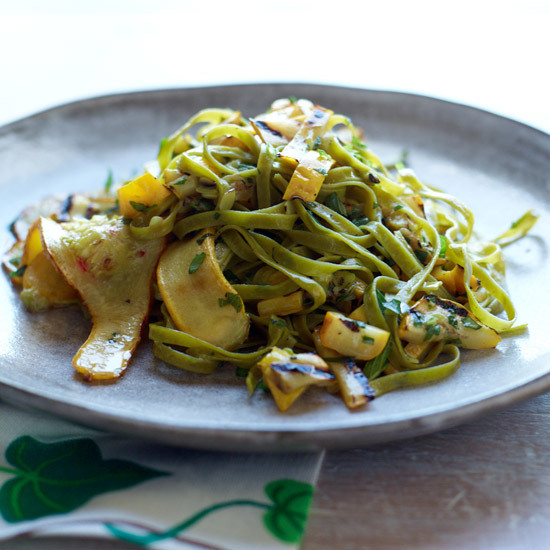 Add the 1/8-inch-thick squash slices and cook over high heat, tossing, until al dente, about 1 minute. Add the rice vinegar, season lightly with salt and toss well. Add the grilled squash and toss to heat through. Remove from the heat. Cook the fettuccine until al dente. Reserve 3/4 cup of the pasta cooking water. Drain the pasta and add it to the skillet. Toss well over moderate heat, gradually adding the reserved pasta cooking water to make a sauce. Season with salt and pepper and transfer to a large bowl. Drizzle the remaining 1 tablespoon of olive oil all over, sprinkle with the chopped tarragon and mint and serve right away. The grilled squash can be refrigerated for up to 2 days. White ales (a variety of wheat beer), like the one from Maine brewery Allagash, tend to be bright and citrusy, a great pairing for this tangy squash. A vibrant Sauvignon Blanc would also be delicious.